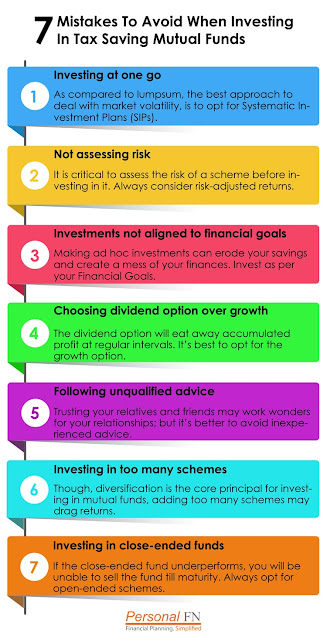 Home > Tax Saving Investment - MF > SEVEN Mistakes To Avoid When Investing In Income Tax Saving Mutual Funds- ELSSs..! SEVEN Mistakes To Avoid When Investing In Income Tax Saving Mutual Funds- ELSSs..! As Equity Linked Savings Scheme (ELSS) funds are market-linked, there is moderate-to-high risk involved. So, merely being blinded by the double-digit past returns is not wise. Many investors also tend to give in to their behavioural biases and end up making mistakes. PersonalFN highlights some of the common mistakes made when investing in ELSS.